Difficulty‐First tier will be played in Hard mode, afterwards all songs will be played in Expert mode. Challenger‐ Will pick the song. Then it will alternate after the first song. - No Cheats, INCLUDING HYPERSPEED!!! - The maximum number of players allowed in this tournament is 16. - Players will be randomly paired up at the start of each match. 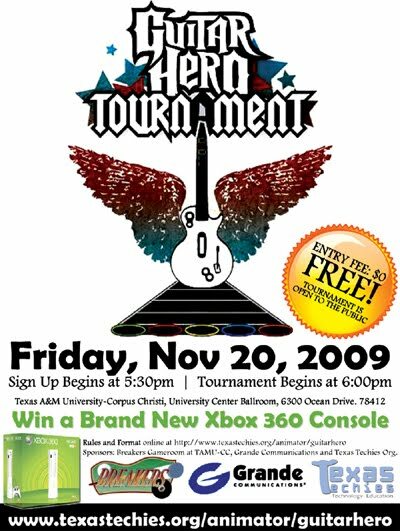 - This tournament for Guitar Hero and will be a single elimination match. - The player who wins best 2 out of 3 songs will advance. - If by any chance there would to be a tie in the 3rd song, players will play a final round in Battle mode. - All games will be played on the Xbox 360. - All games must be played with standard Guitar Hero controllers. - Controllers will be provided. However, you are allowed to bring your controller as long as it is compatible. - The first tier of the tournament will be played in Hard mode. Afterwards, all songs will be played in Expert mode. - Physical threats, racial comments, or inappropriate language and behavior will not be tolerated. If you are warned and not compliant with such guidelines, you will be asked to leave the tournament. Please be courteous to the other players. - There is no pausing allowed. If a player intentionally pauses the game, the Event Moderator has the authority to disqualify that player. Any accidental pausing will be reviewed by the Event Moderators. - Abuse of any equipment (consoles, controllers, TV’s, etc) will result in your disqualification from the tournament and reimbursement of any damaged equipment. - No sideline coaching is allowed. You may cheer or boo as the game progresses (and you’re encouraged to do so), but you may not offer advice to anyone playing a game. You will be warned and failure to follow this rule will result in disqualification from the tournament. - If you are more than 5 minutes late to the tournament’s posted start time, you may have to forfeit the tournament. We are not responsible for your own responsibilities. If you advance in any of the matches but have class/work, we have the right to forfeit your position if you are not present when your name is called. - If a player purposely turns off a game while it is in progress, that player will be disqualified from the tournament. Entry into future tournaments may be denied. - Arguing with the Event Moderators about a decision may result in disqualification from the tournament. - If any game glitches are discovered during the tournament giving a player an unfair advantage, the Event Moderators have the right to ban using the glitch after the point in which it is discovered. The Event Moderators have discretion to disqualify the player. - Have fun and good luck! - ALL rulings are final however rules & format are subject to change based on the number of participants.